This morning many of us in southern Minnesota woke up to the sound of thunder, and thus the state has experienced its first thunderstorm of the year. While this may seem early for a thunderstorm, it’s not all too unusual to experience thunder and lightning before the vernal equinox; in fact as recent as February of last year there were reports of “thundersnow,” which is more or less precipitation falling as snow rather than rain during a thunderstorm. In addition to our first thunderstorm of the year, this week has also seen mostly gray, overcast days as well as periods of persistent rain. Temperatures have been consistently in the high 30’s to low 40’s, and it looks like we might even see some temperatures in the 50’s next week along with a couple days of sun (keep your fingers crossed). There is a new ephemeral wetland in the arboretum that we at the Interpretive Center have affectionately named “Lake Linnaeus.” This wetland is nothing more than snowmelt that accumulates each spring in one of the parking lots in front of the Interpretive Center, but combined with the recent rains this puddle has already swelled to fill its usual basin. 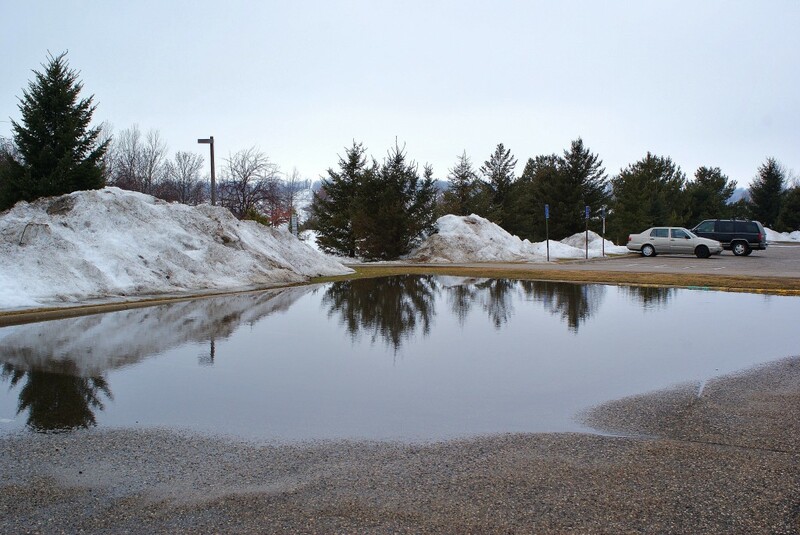 It will be interesting to see just how large Lake Linnaeus will grow in the coming weeks, as there is still plenty of snow yet to melt and more rain in the forecast. But it will be even more interesting to see how all this recent rainfall will affect the Minnesota River, as well as the Red and Mississippi, as conditions are currently being met throughout the state (persistent rainfall and rapid snowmelt) that encourage large-scale flooding. To say the least, the coming weeks should prove rather eventful. "Lake Linnaeus" in front of Interpretive Center, 3/11/10.